Our Paternal Lineage Ancestry DNA Test traces your roots back to mankind’s origins, in the earliest part of human history, to determine your paternal haplogroup affiliation. Would you like to discover more about your family’s ancestry? If you are interested in discovering your genetic origins on your father’s side of the family, our Paternal Lineage Ancestry DNA Test will give you the answers you need. Taking the latest advances in the fields of genetics, anthropology and genealogy and merging these disciplines together, our paternal lineage ancestry DNA test will uncover your deepest ancestral roots. A simple mouth swab sample will enable you to discover where your ancestors came from and follow their migration routes on their amazing journey out of the African continent to the rest of the world. The cost of our paternal lineage ancestry DNA test is £139 with results being issued in 4-5 weeks from receipt of samples. A personalised map which will show you which haplogroup you belong to*, your forefathers’ journeys, where they migrated to and settled. This will include your ancestors time and place of origin. A results manual providing an interpretation of your results as well as valuable information to complement your test. The Paternal Lineage Ancestry DNA Test holds the key to unearthing information about your paternal ancestry that only a DNA Ancestry Test can offer. 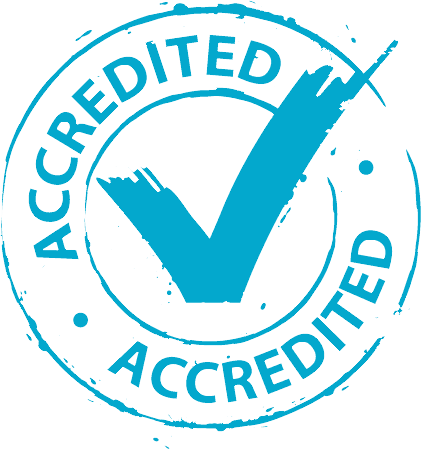 Our advanced laboratory works hard to ensure that we use all of our resources to give you accurate results that you can rely on. Your paternal ancestral genealogy has been handed down from father to son, generation after generation. The test works by looking at the Y chromosome and with special focus on DNA sequences known as Short Tandem Repeats. Analysis of these key parts of your DNA will enable us to discover your very own paternal roots. 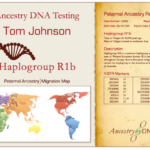 Our test will show you your paternal haplogroup affiliation. 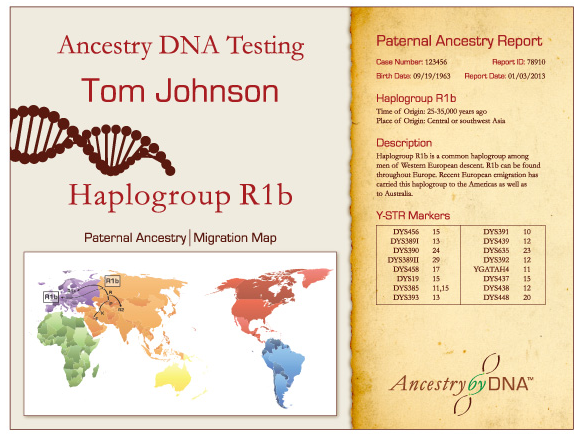 A haplogroup is an important term, referring to the sets of genes inherited from your distant ancestors. These sets of genes are distinct and unique to a group of individuals and will be shared by all individuals in that group. These groups can be matched to a relatively precise geographical region and their migration path traced. A comparison between your DNA and the DNA of the many haplogroups in our database will help us match you to your own haplogroups. Will the Test Tell Me Something About My Forefather’s Nationality? Our Paternal Lineage Ancestry DNA Test traces your roots back to mankind’s origins, in the earliest part of human history. Many thousands of years ago, the continents existed just like they exist today. However, the many countries as we know them today are a very recent addition in the history of mankind. Our test will link you and your ancestors to geographical regions but not countries per se. Can Women Take the Paternal Lineage Ancestry DNA Test? Females do not carry Y chromosomes but this does not mean they cannot discover their paternal ancestry. If a female wants to learn more about her ancient origins from her father’s side of the family, she can simply ask a male relative, such as a brother or father, to take the test. Your paternal lineage is just half of your ancestral origins. Why not delve into the journeys of your ancient foremothers and understand more about where they came from? Click here to read about our Maternal Lineage Ancestry DNA Test. The cost of our Paternal Lineage Ancestry DNA Test is £139. For a limited time, if you order our Paternal Lineage Ancestry DNA Test and Maternal Lineage Ancestry DNA Test (RRP £159) at the same time you pay a total of just £199 for both.